﻿Horizontally ﻿laminated ﻿limestone ﻿nodules, ﻿called ﻿orstenar, ﻿occur ﻿embedded ﻿within ﻿bitumen-rich ﻿(black) ﻿shales, ﻿the ﻿Alum ﻿Shales ﻿of ﻿the ﻿upper ﻿part ﻿of ﻿the ﻿Cambrian ﻿in ﻿Sweden ﻿(now ﻿uppermost ﻿Middle ﻿Cambrian ﻿– ﻿formerly ﻿zone ﻿1 ﻿Agnostus ﻿pisiformis ﻿to ﻿the ﻿Furongian ﻿– ﻿formerly ﻿zones ﻿2 ﻿to ﻿6 ﻿= ﻿Peltura ﻿scarabaeoides ﻿of ﻿the ﻿UC ﻿sequence). ﻿Alum ﻿shales ﻿occur ﻿first ﻿in ﻿the ﻿lower ﻿Cambrian ﻿and ﻿point ﻿to ﻿a ﻿relative ﻿stagnant ﻿water ﻿body ﻿with ﻿organic ﻿(detritus) ﻿rich ﻿bottom ﻿zone. 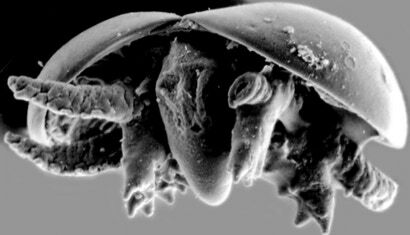 ﻿The ﻿nodules ﻿are ﻿actually ﻿an ﻿accumulation ﻿of ﻿countless ﻿disarticulated ﻿calcitic ﻿head ﻿and ﻿tail ﻿shields ﻿of ﻿the ﻿minute ﻿arthropods, ﻿agnostids, ﻿in ﻿the ﻿lower ﻿zone ﻿exclusively ﻿made ﻿of ﻿Agnostus ﻿pisiformis ﻿(Wahlenberg, ﻿1818). ﻿Due ﻿to ﻿the ﻿content ﻿of ﻿organic ﻿matter, ﻿the ﻿nodules ﻿can ﻿be ﻿brownish ﻿or ﻿very ﻿dark.We ﻿will ﻿add ﻿more ﻿on ﻿these ﻿in ﻿due ﻿course, ﻿with ﻿special ﻿reference ﻿to ﻿the ﻿new ﻿finds ﻿in ﻿China. ﻿Left: ﻿Quarry ﻿near ﻿Falbygden, ﻿Västergötland, ﻿Sweden. ﻿Exposed ﻿are ﻿the ﻿Furongian ﻿and ﻿Lower ﻿Ordovician. 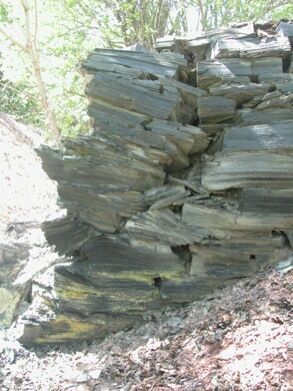 ﻿Lower ﻿part ﻿with ﻿black, ﻿organic-rich ﻿alum ﻿shales ﻿(alunskiffer ﻿in ﻿Swedish), ﻿topped ﻿by ﻿a ﻿hiatus ﻿of ﻿0.5 ﻿m, ﻿and ﻿1–1.5 ﻿m ﻿mudstones ﻿forming ﻿the ﻿basis ﻿of ﻿the ﻿Tremadocian ﻿(Ceratopyge ﻿shales). ﻿Above, ﻿banked ﻿Ordovician ﻿limestones ﻿(Latorp ﻿limestone). ﻿'Orsten' ﻿nodules ﻿within ﻿the ﻿shales. ﻿In ﻿this ﻿region, ﻿post-Cambrian ﻿dolerite ﻿caps ﻿have ﻿protected ﻿the ﻿less ﻿erosion ﻿resistant ﻿Alum ﻿Shales ﻿and ﻿other ﻿Palaeozoic ﻿strata, ﻿forming ﻿the ﻿characteristic ﻿table ﻿mountains ﻿("Tafelberge") ﻿of ﻿Västergötland, ﻿most ﻿notably ﻿Kinnekulle. ﻿Photograph: ﻿Dieter ﻿Waloszek ﻿1989 ﻿– ﻿site ﻿now ﻿"destroyed" ﻿due ﻿to ﻿recreation ﻿activities ﻿after ﻿the ﻿quarry ﻿had ﻿been ﻿expired. 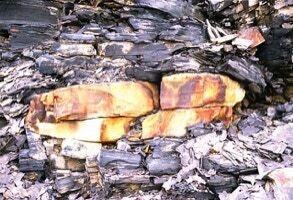 ﻿Right: ﻿The ﻿surrounding ﻿alum ﻿shales, ﻿as ﻿here ﻿from ﻿a ﻿quarry ﻿in ﻿Skåne, ﻿Sweden, ﻿are ﻿a ﻿finely ﻿layered ﻿compaction ﻿series ﻿of ﻿up ﻿to ﻿100 ﻿m ﻿– ﻿mostly ﻿much ﻿less ﻿– ﻿of ﻿bituminous ﻿shale ﻿with ﻿a ﻿notable ﻿heavy-metal ﻿content ﻿(see ﻿e.g. : ﻿Buchardt, ﻿B. ﻿1989. ﻿Irradiation ﻿of ﻿organic ﻿matter ﻿by ﻿uranium ﻿decay ﻿in ﻿the ﻿Alum ﻿Shale, ﻿Sweden. ﻿Geochimica ﻿et ﻿Cosmochimica ﻿Acta ﻿53(6),1307-1322.). ﻿Left: ﻿Orsten' ﻿nodule ﻿embedded ﻿within ﻿alum ﻿shales ﻿(same ﻿quarry ﻿as ﻿above). 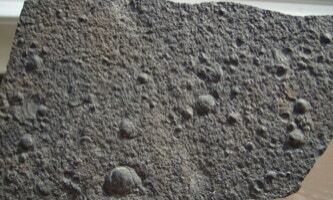 ﻿Often ﻿the ﻿nodules ﻿are ﻿surrounded ﻿by ﻿a ﻿crystallitic ﻿crust ﻿of ﻿limestone. 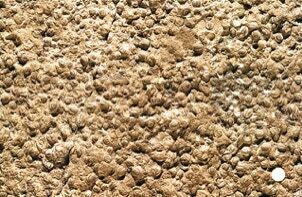 ﻿Center: ﻿Surface ﻿of ﻿a ﻿fractured ﻿nodule ﻿with ﻿countless ﻿number ﻿of ﻿agnostid ﻿shields. ﻿Often ﻿these ﻿are ﻿sorted ﻿(dot ﻿= ﻿5 ﻿mm). ﻿Walnut-size ﻿pieces ﻿of ﻿this ﻿rock ﻿have ﻿been ﻿dissolved ﻿to ﻿receive ﻿the ﻿non-calcitic ﻿content. ﻿Right: ﻿Dark ﻿butimen-rich ﻿nodule ﻿with ﻿different ﻿trilobites ﻿and ﻿agnostid ﻿shields. ﻿The ﻿name ﻿'orsten' ﻿derives ﻿from ﻿a ﻿local ﻿dialect ﻿word ﻿for ﻿pig, ﻿'orne' ﻿and ﻿the ﻿Swedish ﻿word ﻿for ﻿stone, ﻿'sten'. ﻿It ﻿is ﻿assumed ﻿that ﻿the ﻿name ﻿derives ﻿from ﻿the ﻿use ﻿of ﻿ground ﻿'orsten' ﻿as ﻿veterinary ﻿medicine ﻿for ﻿domestic ﻿pigs. ﻿It ﻿is ﻿often ﻿translated ﻿to ﻿'stinkstone' ﻿due ﻿to ﻿the ﻿characteristic ﻿smell ﻿("rotten ﻿eggs"), ﻿when ﻿struck ﻿or ﻿split. ﻿The ﻿nodules ﻿were ﻿also ﻿burnt ﻿to ﻿produce ﻿fertilizer. 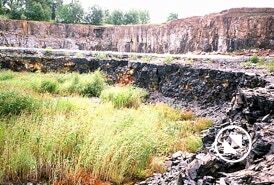 ﻿Most ﻿Alum ﻿Shale ﻿and ﻿'Orsten' ﻿quarries ﻿are ﻿now ﻿abandoned. ﻿Nowadays, ﻿nodules ﻿are ﻿frequently ﻿uncovered ﻿in ﻿the ﻿Falbygden ﻿area, ﻿Västergötland, ﻿along ﻿roads ﻿when ﻿newly ﻿constructing ﻿them. ﻿More ﻿finds ﻿were ﻿from ﻿the ﻿Isle ﻿of ﻿Öland ﻿and ﻿in ﻿Skåna, ﻿but ﻿there ﻿no ﻿'Orsten-type' ﻿fossils ﻿were ﻿found. ﻿Above: ﻿Occurrence ﻿of ﻿'Orsten' ﻿rock ﻿in ﻿Scandinavia ﻿(left) ﻿and ﻿around ﻿the ﻿hill ﻿Kinnekulle ﻿at ﻿lake ﻿Vänern, ﻿Västergötland ﻿(from ﻿Castellani ﻿et ﻿al. ﻿2018. ﻿(9) ﻿on ﻿right ﻿map: ﻿the ﻿famous ﻿locality ﻿Gum, ﻿now ﻿a ﻿nature ﻿reserve). ﻿Below ﻿photograph ﻿of ﻿Dieter ﻿Waloszek ﻿from ﻿2004, ﻿taken ﻿from ﻿the ﻿south. ﻿Distance ﻿Gum ﻿– ﻿Öland ﻿approx. ﻿330 ﻿km. ﻿In ﻿the ﻿meantime ﻿the ﻿meaning ﻿of ﻿'Orsten' ﻿changed ﻿so ﻿that ﻿today ﻿we ﻿understand ﻿by ﻿'Orsten' ﻿a ﻿conservat ﻿lagerstaette ﻿yielding ﻿fossils, ﻿mainly ﻿tiny, ﻿in ﻿a ﻿special ﻿type ﻿of ﻿preservation, ﻿namely ﻿secondary ﻿three-dimensional ﻿preservation ﻿of ﻿the ﻿outer ﻿surface/cuticular ﻿layer ﻿of ﻿mainly ﻿arthropods ﻿and ﻿nemathelminth ﻿worms ﻿(only ﻿particular ﻿regions), ﻿recently ﻿also ﻿holding ﻿for ﻿cyanobacterial ﻿threads, ﻿their ﻿outer ﻿sheets ﻿being ﻿preserved. ﻿In ﻿the ﻿same ﻿way, ﻿when ﻿talking ﻿about ﻿3D-preserved ﻿animals ﻿from ﻿'Orsten' ﻿localities ﻿we ﻿talk ﻿of ﻿'Orsten' ﻿fossils ﻿or ﻿'Orsten' ﻿fossil ﻿assemblages ﻿or ﻿biota. ﻿According ﻿to ﻿our ﻿experience, ﻿only ﻿very ﻿few ﻿of ﻿the ﻿Swedish ﻿'Orsten' ﻿nodules ﻿we ﻿collected ﻿yielded ﻿phosphatized ﻿arthropod ﻿remains. 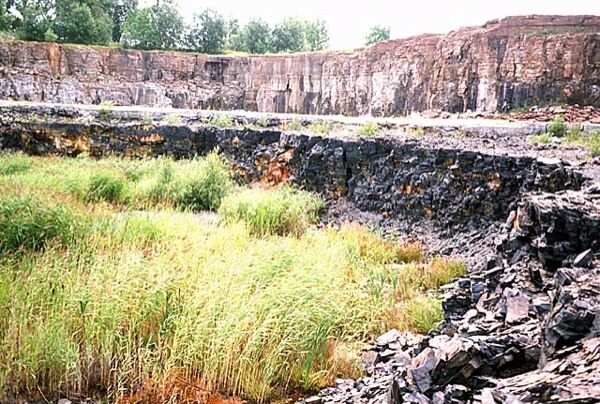 ﻿In ﻿fact, ﻿only ﻿two ﻿nodules ﻿from ﻿the ﻿Gum ﻿quarry ﻿at ﻿Kinnekulle, ﻿Västergötland, ﻿yielded ﻿the ﻿bulk ﻿of ﻿our ﻿material. ﻿Most ﻿of ﻿the ﻿nodules, ﻿representing ﻿a ﻿time ﻿frame ﻿of ﻿at ﻿least ﻿1 ﻿million ﻿years, ﻿have ﻿yielded ﻿few ﻿to ﻿single ﻿specimens, ﻿if ﻿at ﻿all.! ﻿Accordingly, ﻿it ﻿is ﻿unlikely ﻿that ﻿the ﻿fossils ﻿represent ﻿an ﻿allochthonous ﻿thanatocoenosis ﻿or ﻿have ﻿been ﻿killed ﻿in ﻿a ﻿event ﻿comparable ﻿to ﻿stagnant, ﻿anoxic ﻿conditions ﻿at ﻿certain ﻿times ﻿during ﻿a ﻿year, ﻿as ﻿occurring ﻿today ﻿in ﻿the ﻿Baltic ﻿Sea ﻿sometimes ﻿or ﻿in ﻿the ﻿Mediterranean ﻿Sea. ﻿More ﻿or ﻿less ﻿they ﻿represent ﻿the ﻿very ﻿rare ﻿event ﻿of ﻿preservation ﻿– ﻿such ﻿as ﻿the ﻿Ötzi ﻿in ﻿a ﻿glacier ﻿in ﻿the ﻿Alps. ﻿After ﻿etching ﻿the ﻿nodules ﻿by ﻿using ﻿a ﻿mild ﻿acid ﻿(10%ic ﻿acetic ﻿acid), ﻿the ﻿non-calcitic ﻿residues ﻿remain ﻿(on ﻿the ﻿sieves ﻿in ﻿the ﻿buckets). ﻿The ﻿residues ﻿contain ﻿silicified ﻿fossils, ﻿such ﻿as ﻿sponge ﻿spicules ﻿(but ﻿no ﻿grains ﻿indicative ﻿of ﻿sandy ﻿components), ﻿coarser ﻿phosphatic ﻿matter ﻿and ﻿phosphatic ﻿or ﻿phosphatized ﻿fossils. ﻿Some ﻿can ﻿be ﻿assigned ﻿to ﻿so-called ﻿"small ﻿shelly" ﻿fossils ﻿= ﻿minute ﻿fossils, ﻿parts ﻿or ﻿entire, ﻿of ﻿unclear ﻿affinities ﻿, ﻿(primarily ﻿phosphatized) ﻿conodonts, ﻿shells ﻿of ﻿(primary?) ﻿phosphatic ﻿brachiopods ﻿(mainly ﻿Obolus ﻿– ﻿and ﻿secondarily ﻿phosphatized ﻿remains ﻿of ﻿arthropods. ﻿Klaus ﻿Müller, ﻿originally ﻿interested ﻿in ﻿the ﻿conodonts ﻿in ﻿the ﻿nodules, ﻿concentrated ﻿in ﻿his ﻿projects ﻿funded ﻿by ﻿the ﻿German ﻿Research ﻿Foundation, ﻿on ﻿arthropod ﻿remains. ﻿Subsequently ﻿information ﻿increased ﻿and ﻿the ﻿views ﻿changed ﻿accordingly. ﻿Particularly ﻿the ﻿new ﻿finds ﻿outside ﻿Sweden ﻿demonstrated ﻿larger ﻿differences ﻿between ﻿the ﻿various ﻿types ﻿of ﻿rock ﻿that ﻿yield ﻿'Orsten' ﻿preservation ﻿than ﻿previously ﻿expected ﻿to ﻿yield ﻿'Orsten' ﻿fossils. ﻿The ﻿time ﻿table ﻿of ﻿major ﻿localities ﻿through ﻿time ﻿that ﻿yielded ﻿fossils ﻿in ﻿3D ﻿preservation ﻿demonstrates ﻿two ﻿aspects: ﻿1) ﻿the ﻿remarkable ﻿amount ﻿in ﻿the ﻿Early ﻿Palaeozoic, ﻿and, ﻿2) ﻿the ﻿wide ﻿geological ﻿record ﻿of ﻿the ﻿Orsten. ﻿More ﻿in ﻿one ﻿of ﻿the ﻿next ﻿chapters. 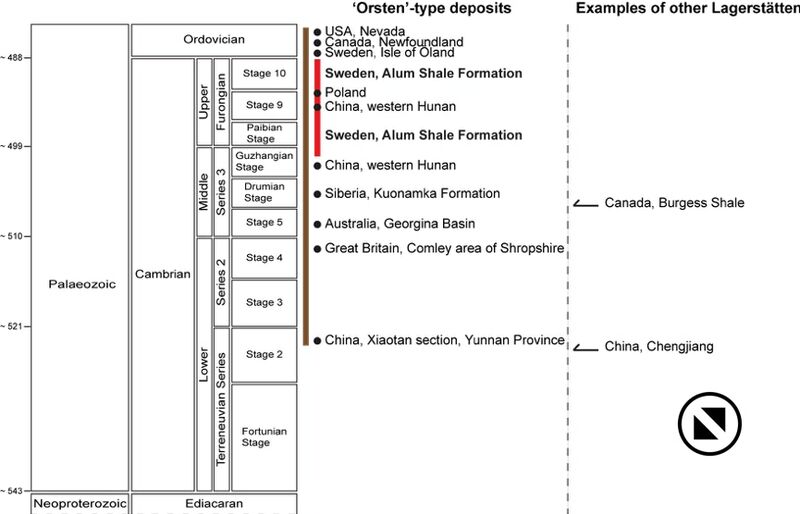 ﻿Timescale ﻿with ﻿'Orsten'-type ﻿finds: ﻿brown, ﻿total ﻿range; ﻿red, ﻿Swedish ﻿occurrences. ﻿2. 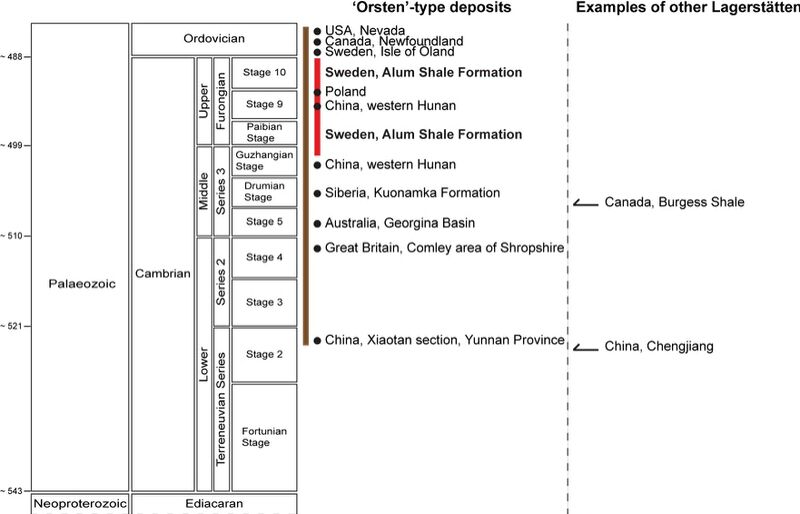 ﻿What ﻿are ﻿'Orsten'(-type) ﻿fossils? ﻿'Orsten' ﻿fossils ﻿are ﻿minute ﻿and ﻿secondarily ﻿phosphatized ﻿(calcium ﻿fluor ﻿phosphate ﻿= ﻿apatite, ﻿like ﻿in ﻿our ﻿teeth) ﻿bodies ﻿of ﻿in ﻿the ﻿main ﻿arthropods ﻿including ﻿their ﻿outgrowths ﻿– ﻿eyes, ﻿appendages, ﻿membranes ﻿etc., ﻿altogether ﻿called ﻿"soft ﻿parts". ﻿This ﻿phosphatization ﻿seems ﻿not ﻿to ﻿have ﻿affected ﻿the ﻿sclerotic ﻿parts ﻿of ﻿a ﻿cuticle, ﻿not ﻿the ﻿chitinous ﻿layer ﻿anyway, ﻿but ﻿the ﻿outermost ﻿layer ﻿at ﻿least ﻿of ﻿arthropods, ﻿the ﻿epicuticle. ﻿This ﻿layer ﻿contains ﻿lipoproteids ﻿and ﻿serves ﻿as ﻿protection ﻿and ﻿boundary ﻿against ﻿water, ﻿so ﻿is ﻿hydrophobic. ﻿It ﻿is ﻿also ﻿the ﻿layer ﻿that ﻿produces ﻿the ﻿finest ﻿details ﻿such ﻿as ﻿bristles, ﻿wrinkles ﻿on ﻿membranes ﻿or ﻿pits ﻿preserved ﻿in ﻿'Orsten' ﻿fossils. ﻿If ﻿only ﻿deeper ﻿parts ﻿would ﻿be ﻿preserved ﻿one ﻿would ﻿have ﻿much ﻿more ﻿coarsely ﻿preserved ﻿fossils. 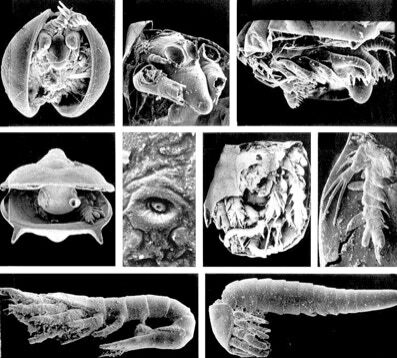 ﻿Remarkably, ﻿the ﻿best ﻿preserved ﻿and ﻿most ﻿complete ﻿specimens ﻿are ﻿the ﻿smallest, ﻿ca. ﻿100 ﻿µm ﻿long, ﻿while ﻿of ﻿larger ﻿forms ﻿we ﻿have ﻿only ﻿fragments ﻿at ﻿hand. ﻿Remarkably, ﻿we ﻿did ﻿not ﻿find ﻿any ﻿fossil ﻿fragment ﻿larger ﻿than ﻿2 ﻿mm ﻿in ﻿the ﻿Swedish ﻿material, ﻿even ﻿when ﻿the ﻿animal ﻿could ﻿be ﻿reconstructed ﻿to ﻿be ﻿longer. ﻿Until ﻿now ﻿the ﻿majority ﻿of ﻿arthropods ﻿described ﻿has ﻿been ﻿affiliated ﻿with ﻿the ﻿Crustacea, ﻿in ﻿more ﻿detail ﻿identified ﻿as ﻿representatives ﻿of ﻿different ﻿evolutionary ﻿levels. ﻿Also ﻿other ﻿arthropods ﻿were ﻿discovered ﻿ranging ﻿from ﻿a ﻿representative ﻿of ﻿another ﻿euarthropod ﻿groups, ﻿the ﻿spider ﻿group, ﻿Chelicerata, ﻿to ﻿representatives ﻿of ﻿all ﻿three ﻿offshoots ﻿of ﻿the ﻿early ﻿arthropod ﻿lineage, ﻿pentastomids, ﻿tardigrades ﻿and ﻿lobopodians. ﻿More ﻿recently, ﻿also ﻿fossils ﻿of ﻿representatives ﻿of ﻿a ﻿group ﻿of ﻿worms, ﻿the ﻿Nemathelminthes ﻿considered ﻿as ﻿the ﻿sister ﻿taxon ﻿to ﻿all ﻿other ﻿gastroneuralian ﻿animals ﻿(those ﻿with ﻿ganglial ﻿"brain" ﻿and ﻿(also ﻿ventral) ﻿nerve ﻿strands ﻿through ﻿the ﻿body) ﻿were ﻿found. ﻿This ﻿includes ﻿even ﻿so-called ﻿embryonic ﻿stages ﻿of ﻿a ﻿form ﻿named ﻿Markuelia, ﻿but ﻿are ﻿almost ﻿finished ﻿worms ﻿within ﻿a ﻿much ﻿developed ﻿egg ﻿shell. ﻿On ﻿the ﻿other ﻿hand, ﻿no ﻿"soft ﻿parts" ﻿of ﻿other ﻿animal ﻿groups ﻿could ﻿be ﻿detected ﻿so ﻿far, ﻿also ﻿not ﻿the ﻿smallest ﻿bit ﻿of ﻿trilobites, ﻿which ﻿are, ﻿otherwise, ﻿common ﻿in ﻿the ﻿rock. ﻿The ﻿'Orsten' ﻿rocks ﻿as ﻿a ﻿whole ﻿contain ﻿also ﻿many ﻿other ﻿fossils, ﻿phosphatic ﻿and ﻿not ﻿phosphatic, ﻿such ﻿as ﻿conodonts ﻿or ﻿the ﻿so-called ﻿small ﻿shellies, ﻿"horny" ﻿= ﻿primarily ﻿phosphatized ﻿brachiopods, ﻿and ﻿there ﻿are ﻿also ﻿shelly ﻿= ﻿calcitic ﻿fragments ﻿of ﻿macrofaunal ﻿elements ﻿in ﻿surrounding ﻿rocks, ﻿such ﻿as ﻿agnostids, ﻿brachiopods ﻿and ﻿trilobites, ﻿but ﻿we ﻿do ﻿not ﻿count ﻿these ﻿as ﻿'Orsten' ﻿fossils ﻿because ﻿of ﻿the ﻿lack ﻿of ﻿cuticular ﻿preservation, ﻿i.e. ﻿lack ﻿any ﻿softparts, ﻿but ﻿only ﻿calcified ﻿exoskeletal ﻿parts ﻿– ﻿shields ﻿and ﻿shells ﻿– ﻿and ﻿even ﻿if ﻿some ﻿of ﻿the ﻿fossils ﻿are ﻿3d-preserved. ﻿The ﻿exception ﻿is ﻿the ﻿rock-forming ﻿Agnostus ﻿pisiformis ﻿of ﻿which ﻿the ﻿rock ﻿contains ﻿calcitic ﻿shields, ﻿while ﻿we ﻿have ﻿more ﻿than ﻿one ﻿hundred ﻿specimens ﻿of ﻿different ﻿immature ﻿stages ﻿with ﻿cuticular ﻿preservation ﻿= ﻿softparts. ﻿As ﻿said, ﻿'Orsten' ﻿fossils ﻿have ﻿the ﻿great ﻿advantage ﻿in ﻿being ﻿three-dimensionally ﻿preserved ﻿and ﻿with ﻿all ﻿surface ﻿structures ﻿in ﻿place, ﻿their ﻿morphological ﻿order. ﻿Accordingly, ﻿they ﻿are ﻿much ﻿easier ﻿to ﻿interpret ﻿than ﻿any ﻿other ﻿fossil ﻿material. ﻿In ﻿fact, ﻿'Orsten' ﻿fossils ﻿are ﻿preserved ﻿virtually ﻿as ﻿if ﻿they ﻿were ﻿just ﻿critical-point ﻿dried ﻿living ﻿organisms. ﻿Details ﻿range ﻿down ﻿to ﻿less ﻿than ﻿1 ﻿µm ﻿and ﻿include ﻿pores, ﻿sensilla ﻿or ﻿minute ﻿secondary ﻿bristles ﻿on ﻿filter ﻿setae, ﻿spines ﻿and ﻿denticles, ﻿in ﻿rare ﻿cases ﻿even ﻿facets ﻿of ﻿so-called ﻿compound ﻿eyes. ﻿'Orsten' ﻿fossils ﻿are, ﻿generally, ﻿small, ﻿i.e., ﻿smaller ﻿than ﻿one ﻿centimeter, ﻿therefore ﻿give ﻿an ﻿insight ﻿of ﻿benthic ﻿life ﻿at ﻿small ﻿scale, ﻿hence ﻿including ﻿also ﻿animals ﻿of ﻿the ﻿small-size ﻿life ﻿zone ﻿or ﻿meiofauna. ﻿Therefore, ﻿it ﻿is ﻿not ﻿surprising ﻿that ﻿our ﻿material ﻿contains ﻿also ﻿many ﻿ontogenetic ﻿stages, ﻿down ﻿to ﻿the ﻿earliest ﻿larvae ﻿hatching ﻿from ﻿an ﻿egg. ﻿In ﻿some ﻿cases, ﻿we ﻿were ﻿able ﻿to ﻿establish ﻿sets ﻿of ﻿successive ﻿stages, ﻿the ﻿longest ﻿being ﻿that ﻿of ﻿Rehbachiella ﻿kinnekullensis ﻿with ﻿30 ﻿stages. ﻿From ﻿larger ﻿fragments ﻿we ﻿even ﻿know ﻿that ﻿this ﻿series ﻿is ﻿still ﻿not ﻿complete. ﻿Possibly ﻿due ﻿to ﻿impregnation ﻿by ﻿phosphate, ﻿most ﻿of ﻿the ﻿specimens ﻿are ﻿hollow ﻿carcasses, ﻿but ﻿some ﻿specimens ﻿may ﻿also ﻿be ﻿completely ﻿solid, ﻿the ﻿reasons ﻿of ﻿it ﻿are ﻿still ﻿unknown. ﻿Fossils ﻿in ﻿a ﻿similar ﻿3D ﻿phosphatic ﻿preservation ﻿range ﻿from ﻿embryonic ﻿stages ﻿(e.g., ﻿early ﻿cleavage ﻿in ﻿various ﻿late ﻿Precambrian ﻿to ﻿Lower ﻿Cambrian ﻿rocks ﻿to ﻿arthropods ﻿in ﻿much ﻿younger ﻿sediments; ﻿examples ﻿are ﻿Triassic ﻿ostracodes ﻿from ﻿Spitsbergen ﻿or ﻿Lower ﻿Cretaceous ﻿ostracodes ﻿and ﻿parasitic ﻿copepods ﻿from ﻿the ﻿Santana ﻿formation, ﻿Brazil. ﻿3D ﻿silification ﻿is ﻿another ﻿unusual ﻿type ﻿of ﻿preservation ﻿of ﻿arthropods, ﻿known ﻿from, ﻿e.g., ﻿the ﻿Tertiary ﻿(Neogene), ﻿having ﻿preserved ﻿crustaceans, ﻿spiders ﻿and ﻿insects ﻿including ﻿immature ﻿stages, ﻿similar ﻿to ﻿the ﻿'Orsten'.